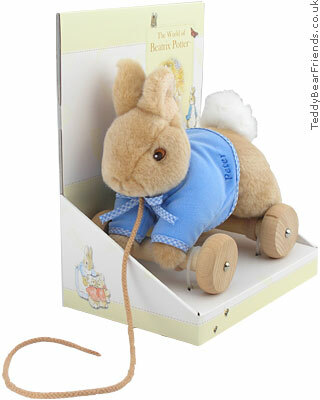 Baby will love this Peter Rabbit pull along toy that can be pulled round the nursery on his wooden wheels. Peter Rabbit has lovely soft brown fur and a white furry tail. Peter's traditional blue jacket has his name embroidered on it so that he can get it back when he loses it again! Made by Augusta Du Bay, Beatrix Potter's Peter Rabbit is a great baby gift that will provide many hours of play.